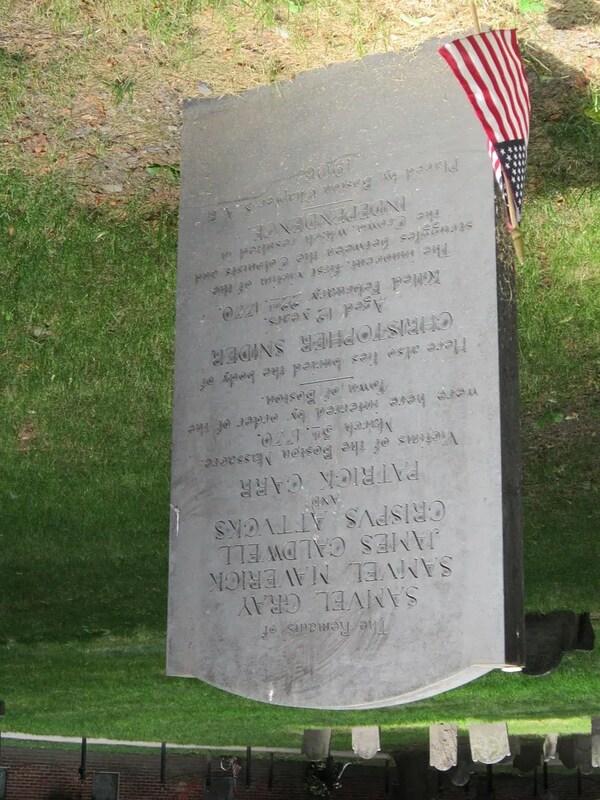 2013 Road Trip Photos, Part 6: Freedom Trail, Part 1 of 3: the Departed « Midlife Crisis Crossover! Day Three was our first full-length day in Boston. We arrived the night before and discovered for ourselves the convoluted, aggravating, illogical, asymmetrical, mind-bending labyrinth that is their street “design”. 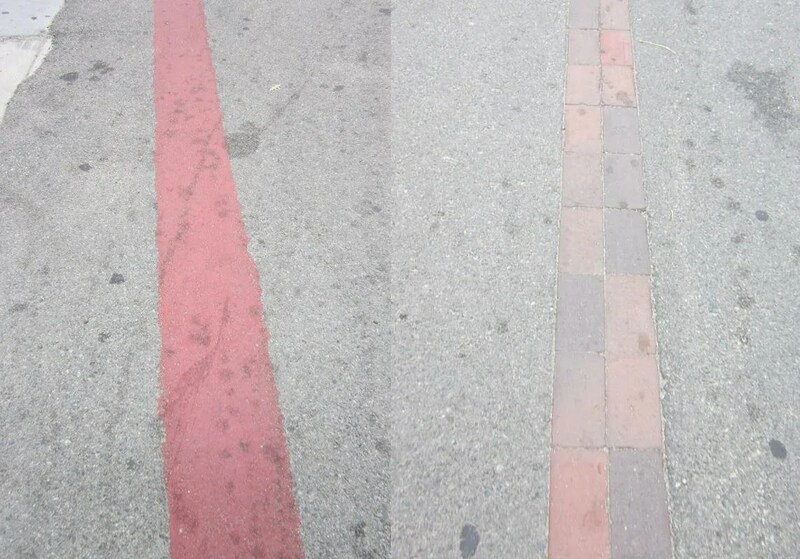 According to a legend I’m making up on the spot based on my exasperated experiences, the Puritans who first settled the area in 1630 chose where their roads should lead by donning blindfolds, spinning around fifty times, and trying to walk in straight lines while carrying overflowing buckets of paint. Wherever they splashed the paint, no matter what contorted shapes it made, even if paint lines crisscrossed, overlapped, swirled in arcs, ran up the side of buildings, dropped into sinkholes, or dead-ended in someone’s parking lot, thus was the gravel laid and the licensed cartographers called in to stamp the resulting wagon-sized entanglements with the Department of Transportation’s official Seal of Approval. When future generations suggested that perhaps some courtesy straightening or extensive rerouting might be in order, those generations were thrashed within an inch of their lives and asked to leave town for attempting to undermine sacred tradition and for daring to badmouth The Way Things Have Always Been. Centuries later, some radical free thinker was appointed to head the Department of Art, Tourism, and Special Events for the Mayor’s Office and was struck by the realization that the city’s tourist trade might go bankrupt if their numerous historical attractions were impossible for tourists to find without using black magic. 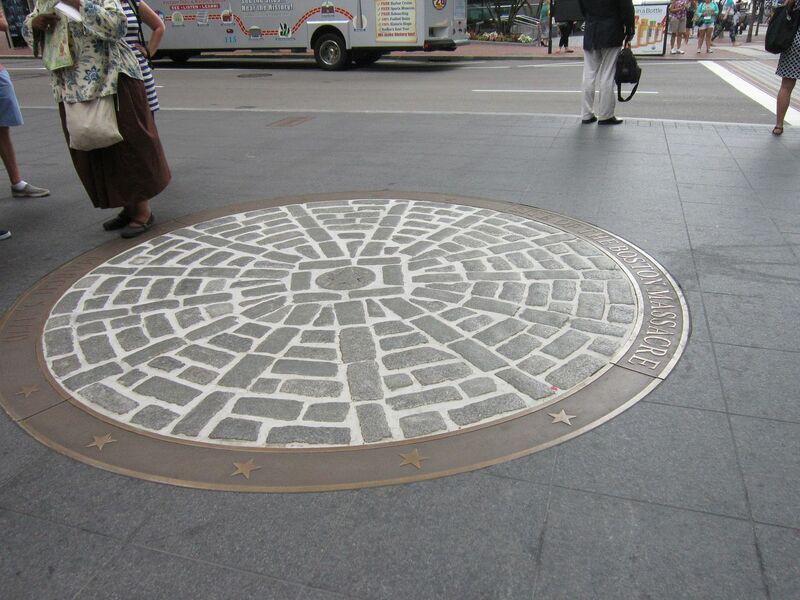 To that end, Boston’s Freedom Trail became the first time we’ve ever seen a major city create a permanent travel guide based on the Raiders of the Lost Ark red-line method. With some portions painted and some made of collinear bricks, the Freedom Trail street guide leads interested parties on a two-mile walking tour of a dozen-plus famous spots of considerable renown without playing a paid game of Follow the Leader with a local part-timer. 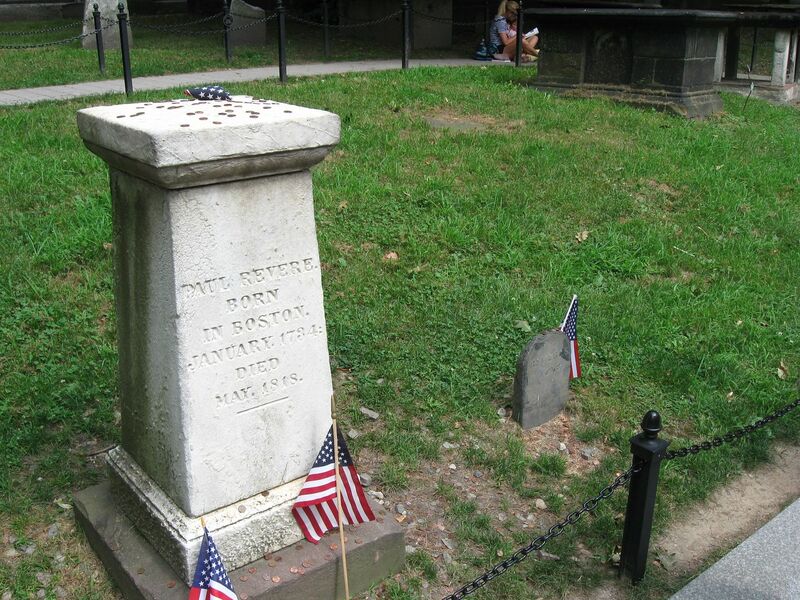 One of the recurring motifs along the Freedom Trail: famous gravesites. In centuries past Massachusetts was populated largely by men who would go on to star or costar in many American history textbooks. 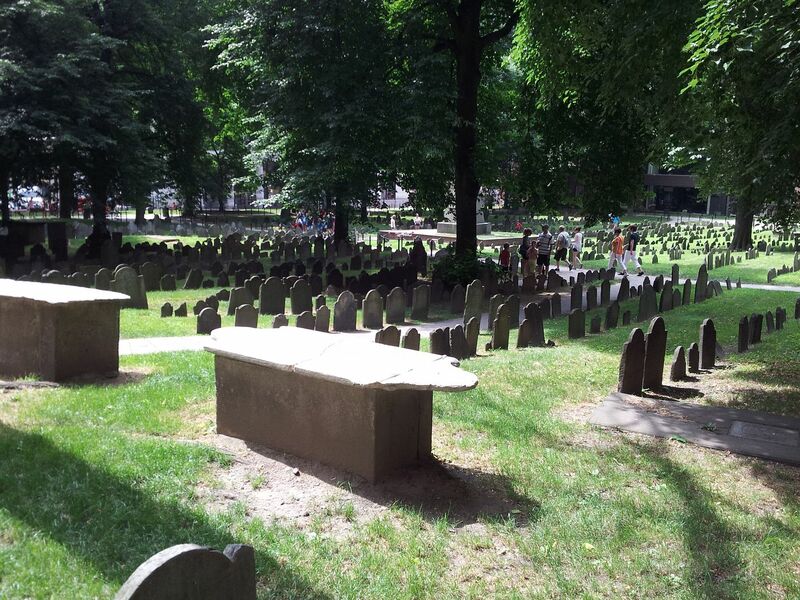 If you begin the trail at Boston Common, the first of three small cemeteries along your path is the 350-year-old Granary Burying Ground. 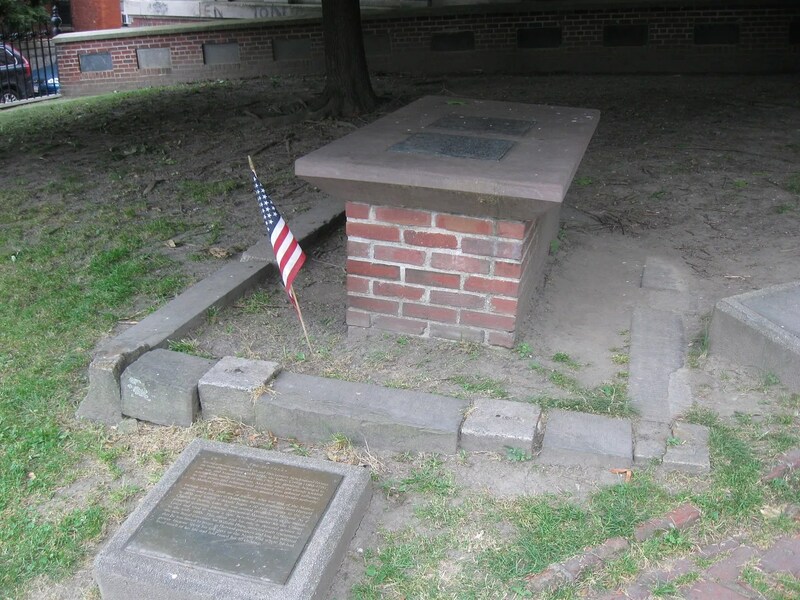 Along its northwest perimeter is the resting place for one Paul Revere, he of the famous “The British are coming!” horse ride. You’ll note two tombstones bear his name. The one that’s tiny, eroded, authentically unimpressive, and not covered in tip-jar coins belongs to his father, Paul Revere Senior. Little-mentioned fact: Revere wasn’t the only nocturnal rider warning everyone about the about the impending British invasion. Meet William Dawes, Jr., one of several announcers on horseback performing the same duty that fateful night. Good luck finding restaurants or Beastie Boys songs named after him and the other guys, though. 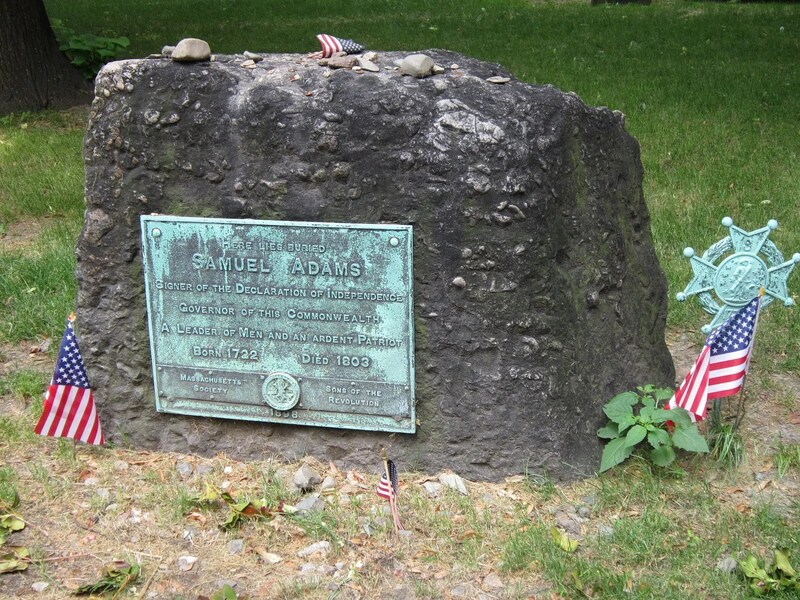 Much more famous is Samuel Adams, one of the leading figures involved in most of our American Revolution lessons. 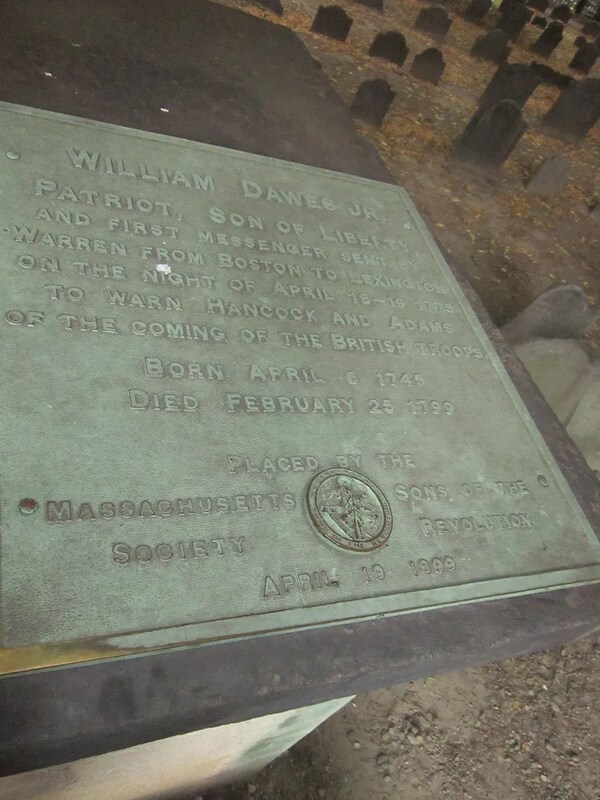 After the Revolution he would become governor of Massachusetts. Centuries later in HBO’s John Adams miniseries he would be played by Danny Huston, who’s had more interesting movie parts in the last five years than I care to list here. During our visit, a tour guide in period costuming led a group of paying customers through the Ground. 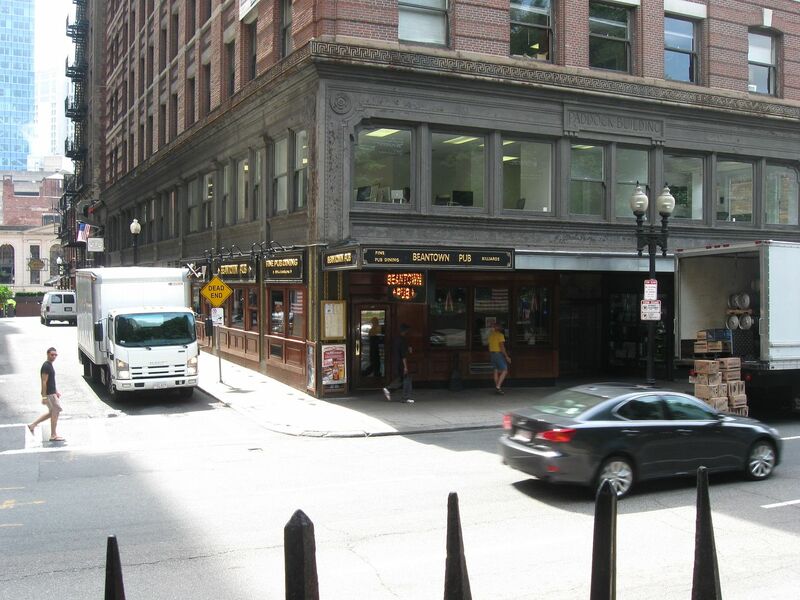 Pointing out the pub across the street, he described it as “the only place in the world where you can drink a cold Sam Adams while looking at a cold Sam Adams.” Colonial tour-guide guy says thank-you and he’ll be here all week. Also at Granary are the victims of the Boston Massacre, not originally interred there but relocated in 1888. I was a little surprised to see Crispus Attucks settle for fourth billing, considering he’s the only one they ever mentioned to us by name in school. For fans of specific geography, the site of the Massacre itself is commemorated a couple blocks away in front of the Old State House. The Revolution isn’t the only war Boston marks. 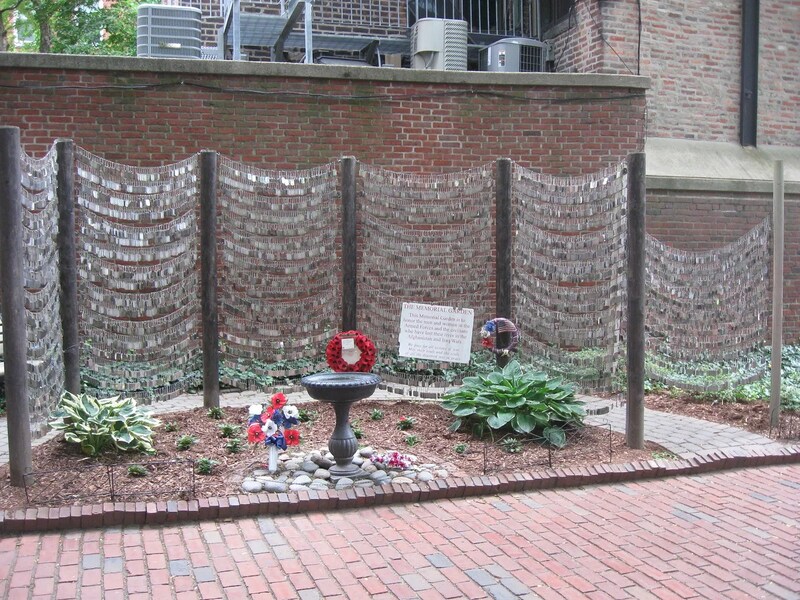 On the grounds of the Old North Church stands a Memorial Garden honoring veterans of Iraq and Afghanistan. Relics from ages past might be easy to take for granted, but reminders of more recent troubles can be a lot more sobering. 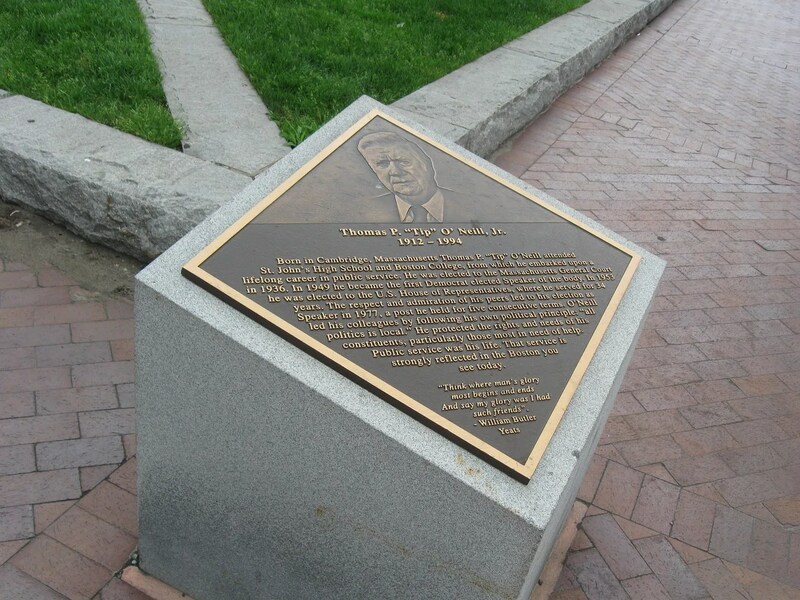 If you prefer memorials that have absolutely nothing to do with war, near the Charles River is a nod to Tip O’Neill, Massachusetts Congressman and longtime Speaker of the House. Amid so many eighteenth-century names and stories, that was, well, certainly different. could you please help me with a reblog? I could really use the publicity. Let me know as soon as possible with a comment on one of my posts. Thanks!